All of Priscilla's puppies have been placed. 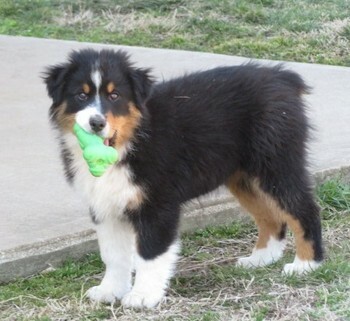 Priscilla & Pony's AKC/ASCA registered Australian Shepherd puppies. DOB 12/13/18. Fifteen Acre Farms is located 30 minutes north of Tulsa, OK and 2-1/2 hours from Oklahoma City. Families and breeders from Canada, Mexico, Netherlands, Puerto Rico, & 45 US states have made their selections here since 2006 so we have plenty of references available & experience transporting live animals via Priority Parcel Service on American, Delta, & United Airlines. Air travel in the continental United States, Alaska, Puerto Rico, & US Virgin Islands is $500 for one puppy or for two puppies flying together at age 8 or 9 weeks. Read the "Shipping" page to address any concerns you may have regarding air travel for live animals and for a breakdown of the cost. Because we are centrally located in the US, our puppies are usually only intransit 2-7 hours depending on destination. View the "Airports" page to choose an airport nearest you for pickup. The purchasing process here is simple. We ask that you subscribe to our youtube channel at Fifteen Acre Farms Australian Shepherds, watch some of our obedience training video's, take a tour of our facilities, then read reviews posted on Facebook and Google from our puppy buyers. 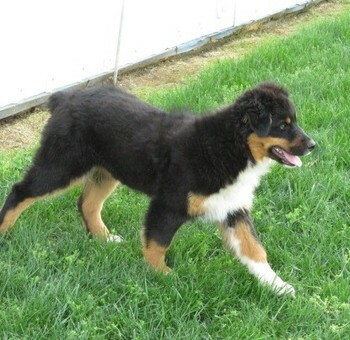 When you feel confident you would like to make your selection here from a breeder who KNOWS and REPRESENTS the breed WELL simply click 'Select This Puppy' below his picture or Puppy + Shipping if your new puppy requires air travel to join your family. I will be notified when a payment is made and will then mark your puppy sold with your name. If you prefer to contact me before purchase call or text Laura Perry at 918-706-1931 or email fifteenacrefarms@yahoo.com. If you email be sure to include your location, if you have a color or gender preference, & a phone number so I can call you. Priscilla & Pony's Black Tri Australian Shepherd Female pictured above. My new home is with Madison in Pala Mesa, CA. Priscilla & Pony's Blue Merle Australian Shepherd Male #1 pictured above. My new home is with Theresa in West Glacier, MT. Priscilla & Pony's Black Tri Australian Shepherd Male #1 pictured above. 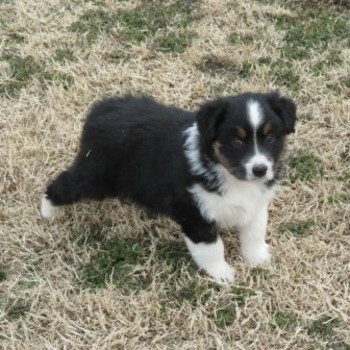 My new home is with Mary in Mannford, OK.
Priscilla & Pony's Black Tri Australian Shepherd Male #3 pictured above. My new home is with Eliana in Decatur, TX. 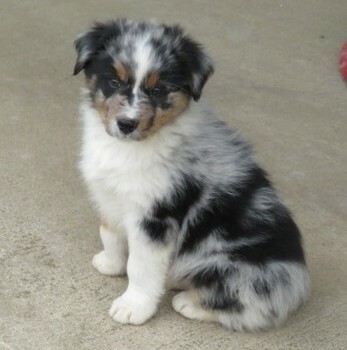 Congratulations on your family's 2nd Fifteen Acre Farms Australian Shepherd! Priscilla & Pony's Black Tri Australian Shepherd Male #5 pictured above. My new home is with Jackie in Murrieta, CA. 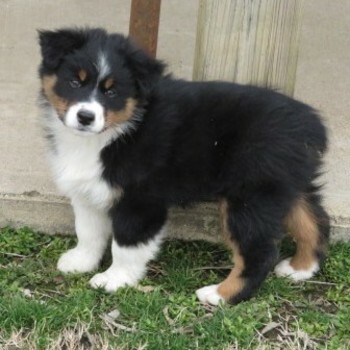 Congratulations on your 2nd Fifteen Acre Farms Australian Shepherd! Priscilla & Pony's Blue Merle Australian Shepherd Female pictured above. My new home is with Jack in Onalaska, WA. 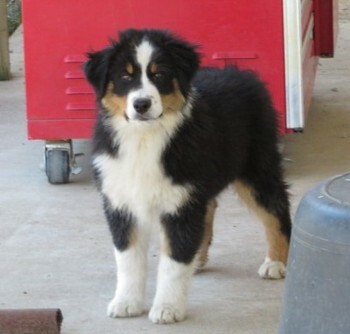 Congratulations on your 3rd Fifteen Acre Farms Australian Shepherd! 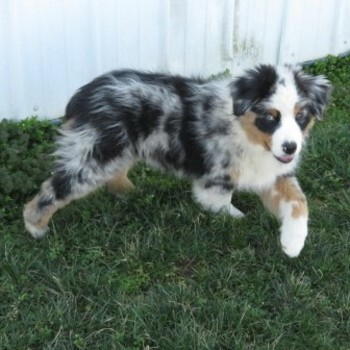 Priscilla & Pony's Blue Merle Australian Shepherd Male #2 pictured above. My new home is with Betty in Grand Prairie, TX. 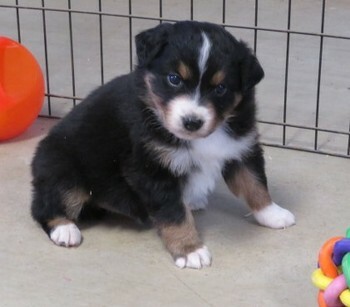 Priscilla & Pony's Black Tri Australian Shepherd Male #2 pictured above. 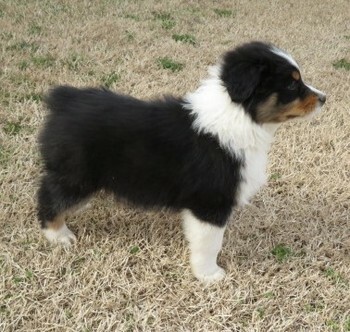 My new home is with Josh & Lyndsey in Tulsa, OK.
Priscilla & Pony's Black Tri Australian Shepherd Male #4 pictured above. My new home is with Cayla in Hanford, CA. 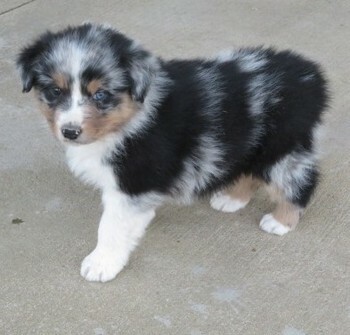 Congratulations on your 2nd Fifteen Acre Farms Australian Shepherd puppy! Priscilla & Pony's Black Tri Australian Shepherd Male #6 pictured above. My new home is with Katlynn in Oologah, OK.